With office workers spending 60-80% of their time sitting during their workday and sedentary behaviour now killing as many people as smoking, this sparked a mission for StepJockey to tackle sedentary behaviour in the workplace. Despite being having a successful digital product, there was a long way to go to increase engagement levels to make it part of everyday use so they approached Despark to redesign and develop the platform. Digitally transform the app’s experience, making it more engaging for regular use and encourage users to invite new participators along to challenges. The app had to make fitness fun, competitive and become habitual. Historic data from previous players inspired different gamified simulations to create fun and engaging stories. Who knew John from Finance did enough steps in 4 weeks to climb Mount Everest! We took an analytical and experiential approach to develop new wireframes, user stories and design choices that fit the qualitative and quantitative research gathered. All existing features were refined and new useful features were added to finesse the product. These include a step tracker, push notifications and awards, personalised activity score and company wide challenges and mini challenges. The new app added a social element to compete with friends in non participating workplaces, which opened up a B2C market for StepJockey, enabling everyone to engage with its features, drive revenue, whilst increasing virality levels and app downloads. With over 235,000 global stair journeys recorded and 9,400 cross platform downloads, StepJockey has cemented itself as an alternative workplace exercise activity. Having launched in January 2017, the platform has registered a total of 20,405,468 steps - that’s almost 243,000 steps a day!  StepJockey’s engagement rates improved by 12% vs the previous version and over a 3 month period from launch, 6,390 steps were taken by users with an average of 589 calories burnt. The stats are very promising but what was the best achievement is that 74% of actual users reported they felt much healthier after partaking in the StepJockey challenges, with 75% now using the stairs more often and 93% wanting to take part in more challenges! Backed by the Department of Health and an average of 4.5 star app store reviews (5 star ratings consistently since re-launch), StepJockey is changing the way people get fit in the workplace, one step at a time. Visit the StepJockey website, download the app and read more about their corporate wellness offering. Get in touch with us on contact@despark.com if you have a project in mind.